It was my first time with the photo-etched brass and I was kind of nervous. 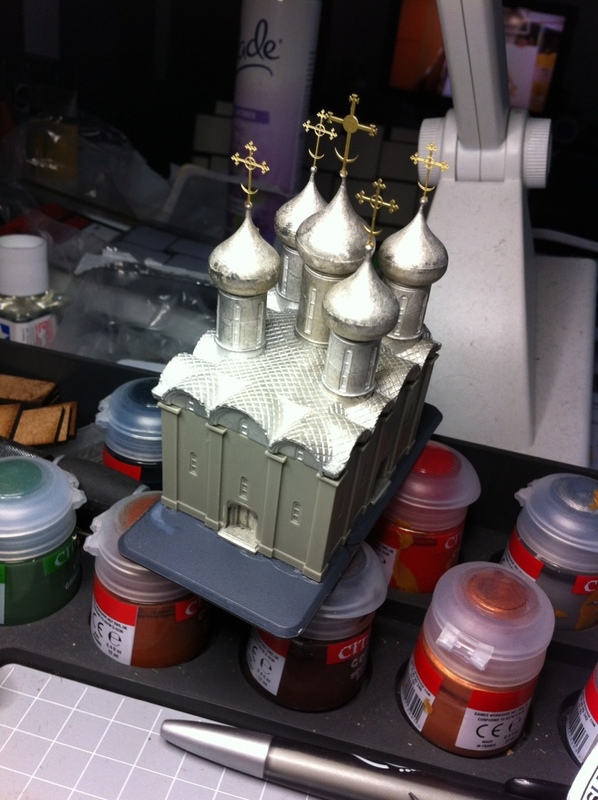 The building that it was on was the GHQ Models Russian Orthodox Church. The brass parts were the crosses for the spires on the church. The brass parts were easy to separate from the brass sheet, simply requiring a little careful work with a sharp knife. I then needed to smooth out (file) where the parts were connected to the brass sheet. Filing was a difficult task as the brass is fine and easy to bend, however, gentle filing with needle files smoothed them out. A bit of superglue work (on my fingers as well as on the building) and the building was complete. It is now prepped in black undercoat and ready for paint as well. You can see the brass crosses on the top of the building. Nice work Thomo will be interested to see this finished.